This beautiful variation is based on the maze pendant style but is given a definitive character with its beautiful red coral. Silver bezel adds further brilliance to the pendant. It measures a total of 2 1/2″ long by 1″ wide. This brilliant Yazzie piece is going for $320 in the market. This is a spectacular carved silver bracelet that features a beautiful spider web turquoise gemstone. It has been mounted on a 14k Gold Bezel. The particular Turquoise used for this purpose originates from Old Tibet. This is a rather rare stone which makes the jewelry item all the more precious. At the turquoise the bracelet measures 7/8″ and it is a perfect fit for wrists measuring 6″ to a 6 1/4″ wrist. It can only be slightly adjusted so make sure you order the right size. Also known as the book of life this impressive design takes its inspiration from the maze design. In ancient Native American tribes this theme was meant to signify the continuity of life. It is 7/8″ wide and cannot be adjusted. You will be able to get your hands on this impressive Yazzie Native American bracelet for $695. Although this particular bracelet features the traditional Native American maze design it gets its edge with the heavy overlaying effect that the designer has used to give the bracelet its character. It measures 3/4″ wide and is a perfect fit for a 6″ to a 6 1/4″ wrist. This one’s available in the market for $415. 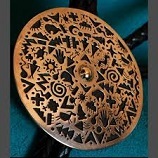 This is one of the most spectacular rings amongst the diverse collection developed by Kee Yazzie. The ring features ancient symbols which are overlaid in a silver ring band. Turquoise gemstones measuring 1 1/8″ x 3/4″ adorn the ring throughout. You can get this one in your ring finger for a little under the five hundred dollar mark. Featuring the ancient symbol of creation manifested in the form of a serpent this piece of Yazzie Native American jewelry is sure to take you back to the roots. It has been meticulously crafted on a silver bracelet featuring a silver overlay serpent. The eye of the serpent is 14k solid gold. Enriched with precious stones and metals this cuff bracelet is going to cost you about nine hundred dollars.